Sorry about the lack of posting lately! But it’s back-to-school time and this year means moving into my own apartment and getting all settled into a new routine. But now I’m back and ready for another WIAW! This week, I’ve just got a random assortment of what I’ve been eating and doing, on and off campus. Even though I’m finally living off campus this year, I’m spending more time on campus with all my classes, working at the campus TV station 2 nights a week and a possible new job. 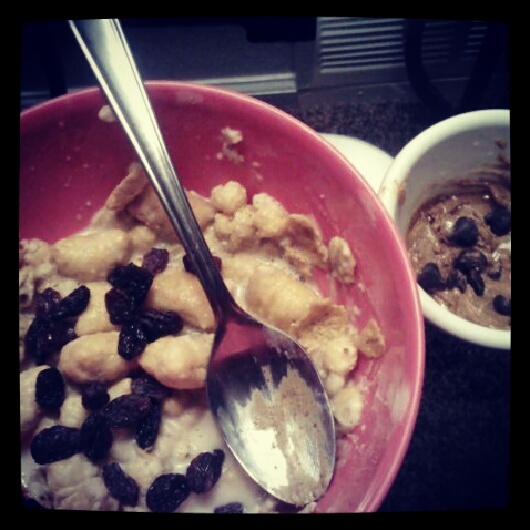 Almond peanut cashew butter mixed with maple syrup and chocolate chips, protein cereal bowl (Nature’s Path sunrise vanilla and PB Puffins mixed with Plant Fusion vanilla pro powder, u/s almond milk and raisins). Protein powder is a must on my busy days for getting protein in. 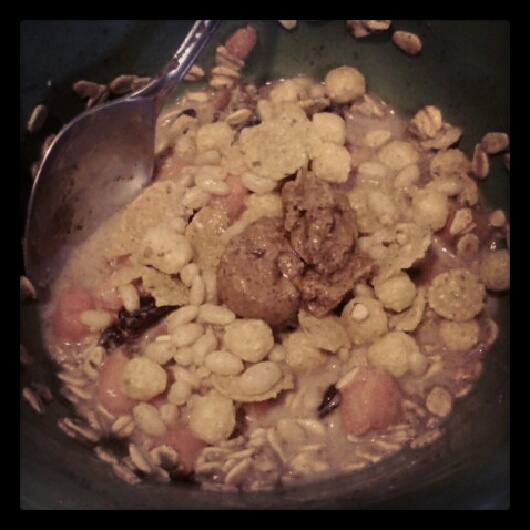 Now I love mixing it in the bottom of my cereal with some almond milk and enjoying the extra flavor and texture boost. My sister and I headed to campus a few days early to hunt down my class locations (some were in buildings I’d never been to before!) 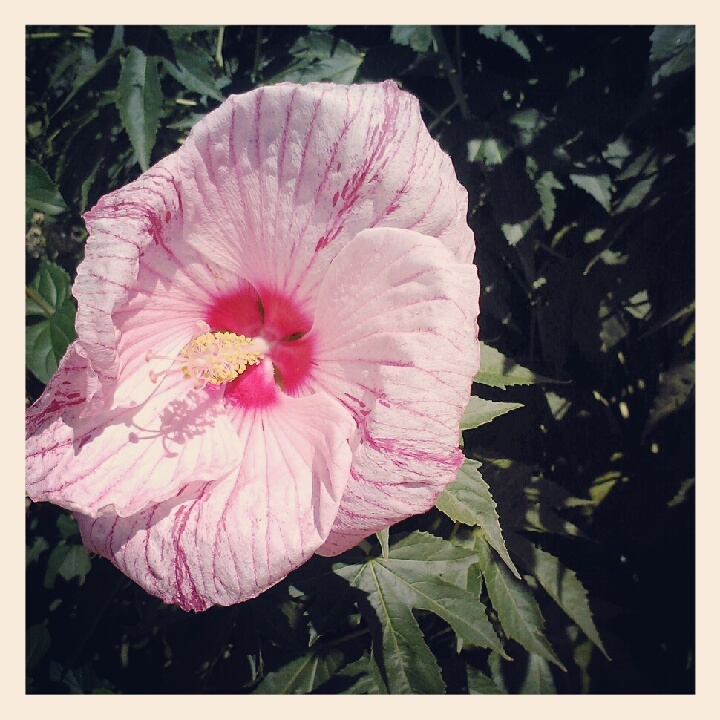 and we saw this awesome flower on our walk. 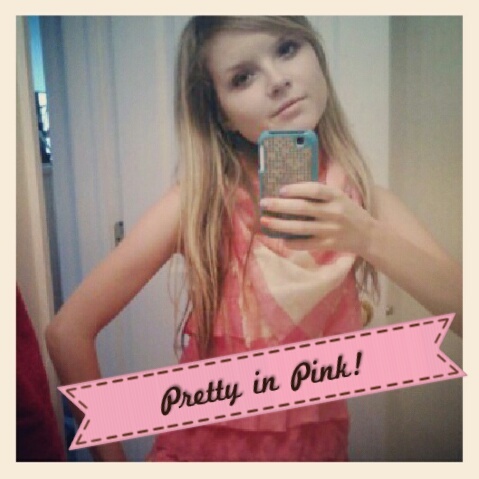 I obviously love how pink it is! 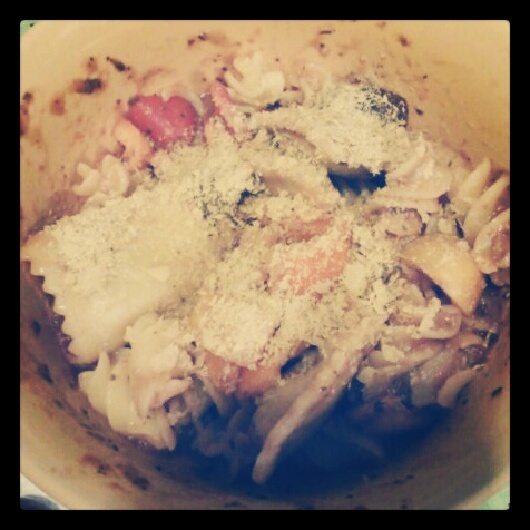 Quinoa pasta and vegan ravioli mixed with basil merlot pasta sauce, mini bell peppers, olives and nooooooooch! A pool? A short walk away? Yes please! 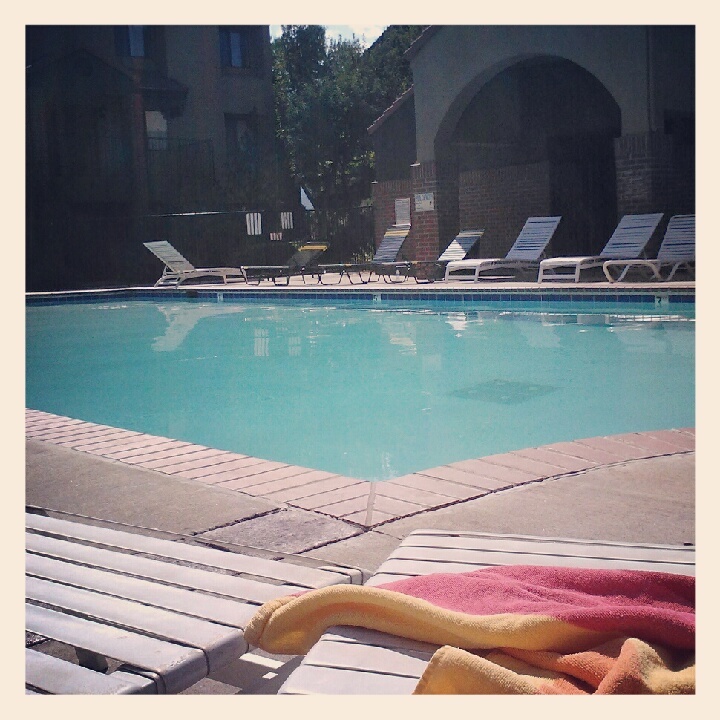 Yes, there is a pool at my apartment. Have I gone in yet? No, but I did spend some time tanning by it with my sis over the weekend. Let’s just say it’s a prime tanning and hang out spot. Hummus and fresh veggie salad on a pita. My mom and I tried a new-to-us place just down the street from my apartment. It was super fast, super fresh and really yum. I didn’t eat the pita part of this pita, but the hummus and veggies were outta this world! 3 minute carrot cake protein oats. This was so good, for a super quickie snack! I mixed thick rolled oats with Truvia, almond milk, chopped carrots, raisins, cinnamon, vanilla protein powder and ground flax and topped it with Nature’s Path sunrise vanilla cereal (so good, and gluten free!) 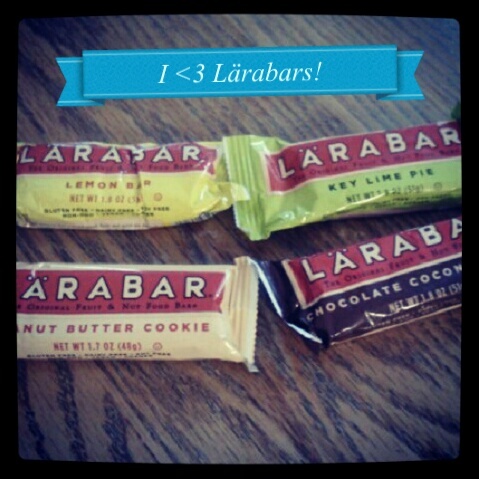 and almond peanut cashew butter. Can I just say I love having a car? 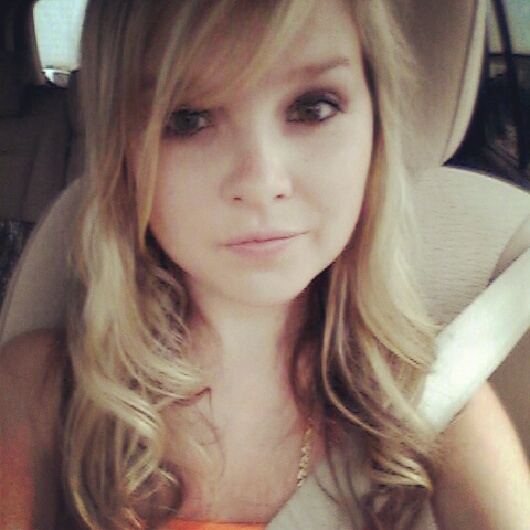 Not only does it make things more convenient, I can also take awesome selfies in it. Alejandro, you’re the best! 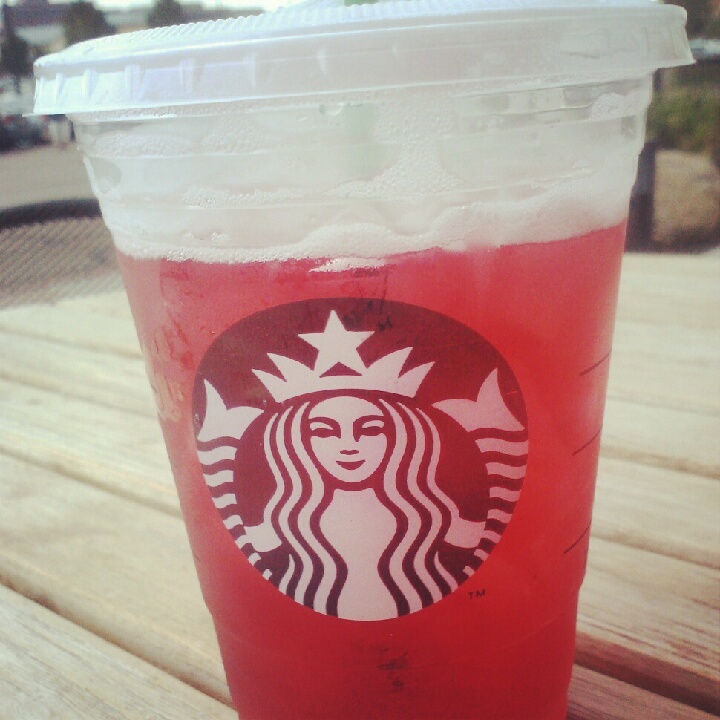 My reward after my first day of classes: grande passion iced tea (unsweetened). I was in desperate need of some Starbies love after my first day of classes. I hit the nearest one up right after my 4 pm class for one of my fave summer drinks and enjoyed it in the sunshine. 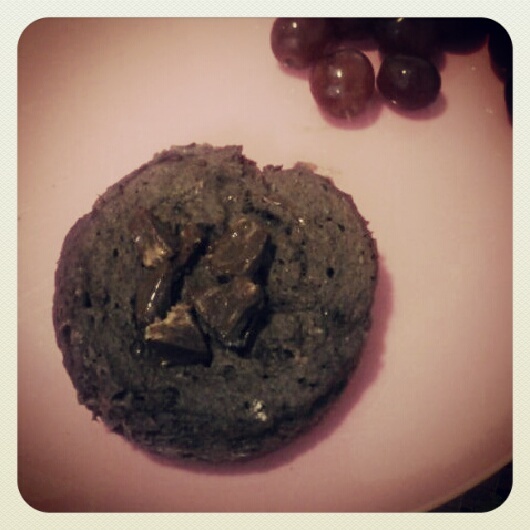 Easy breakfast: chocolate mint protein muffin topped with homemade almond butter cup, grapes. I’ve definitely been getting my kitchen experimenting on, now that I actually have a kitchen! So far, I’ve made no bake peppermint patty bars, mint chocolate almond butter cups and mini buckwheat corn muffins. The bars and cups are the best though–I’ve been on a mint chocolate kick lately. 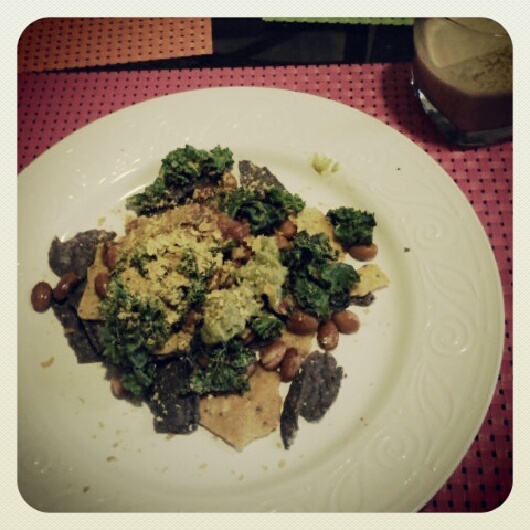 First dinner in my new place: vegan nachos! Made with Late July multigrain chips, pinto beans, spicy guac, peach mango salsa, kale sauteed in coconut oil and nooch. I finally got over my fear of the white stuff and bought some coconut oil. I’ve heard so many good things about the health benefits of it and was sick of avoiding recipes because they included it. I accidentally got the refined kind, but next time I’ll know to get the extra virgin kind for coconutty flavor! Have you used coconut oil? How do you use protein powder? Long time, no recipe post, huh? Sure, I’ve been including recipes here and there in my posts lately, but sometimes it’s nice to devote an entire post to them. I haven’t had one of these since June 10th–almost a month, yikes! But I’ve been doing a lot of experimenting in the kitchen and it’s paid off with two recipes I think you might love. First up, something you might want to whip up as a quick dinner. 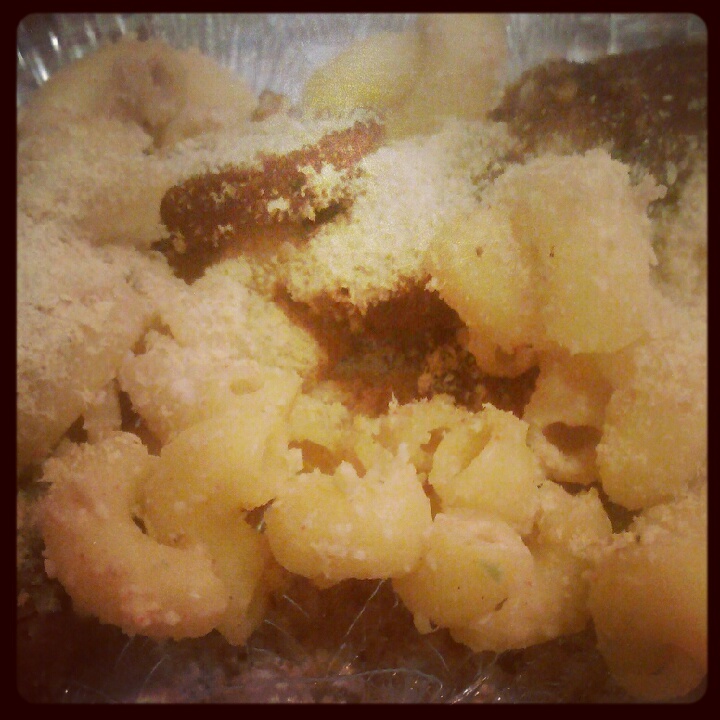 Usually when I have pasta, I use some kind of red sauce or sometimes my spicy nacho cheez sauce for a vegan take on mac ‘n cheese. I rarely even think about pesto, the popular green cousin of tomato sauce. But when I saw a recipe for pumpkin seed pesto on the Whole Foods website, I knew I had to make some for myself…with some changes, of course, to make it my own recipe. 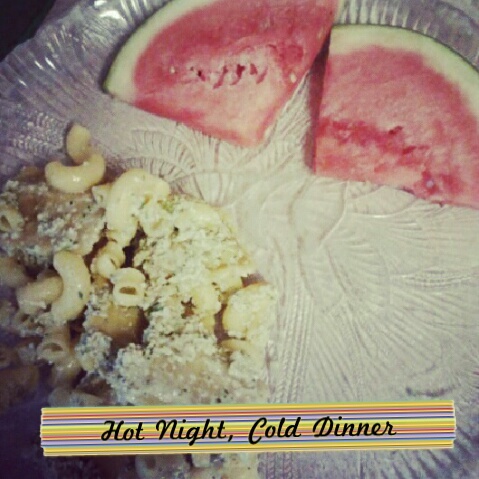 Cheezy pumpkin seed kale pesto over quinoa pasta and Rising Moon artichoke and olive ravioli, watermelon slices. Blend all ingredients in a food processor or blender until combined and creamy. Add more nooch if desired, and serve over pasta, veggies or quinoa. Makes about 1 cup. The pesto paired perfectly with chilled quinoa pasta and soy ricotta ravioli but I also want to try it as a sandwich spread! It’s more nutritious than the typical pesto, because it’s cheese-free (but uses nooch to get that cheezy taste) and uses kale which is packed with Vitamins A & C and has some calcium and fiber. And the pumpkin seeds add an interesting taste and creamy texture to the sauce! And what’s dinner without some dessert afterwards? I usually space my dinner and nighttime snack so there’s about 2 hours in between, just enough time to digest and work up some hunger for dessert! I haven’t baked something in pretty much forever (probably close to two months) so it was definitely time. I made banana bread for the second time ever–the first time was about 3 years ago. 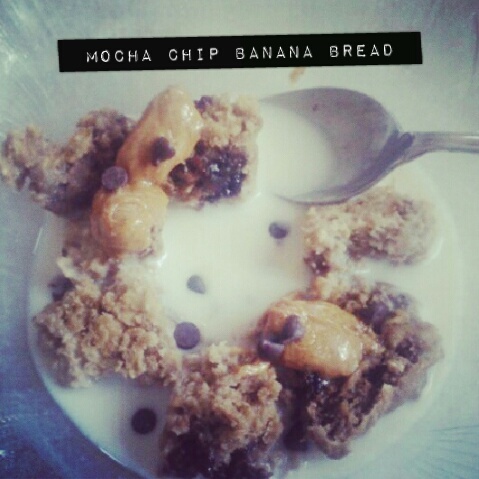 I like banana bread, but I just rarely think to make it. But I didn’t want to just make plain ‘ol banana bread, no, I had to try incorporating some unusual ingredients. It turned out great and even better than normal banana bread. Nothin’ better than warm banana bread crumbled in almond milk topped with almond peanut cashew butter and mini chocolate chips! Preheat oven to 350. Mix together flour, oats, baking powder, salt and chocolate until combined. In a blender or food processor, blend the coffee, bananas and maple syrup until smooth and mixed thoroughly. 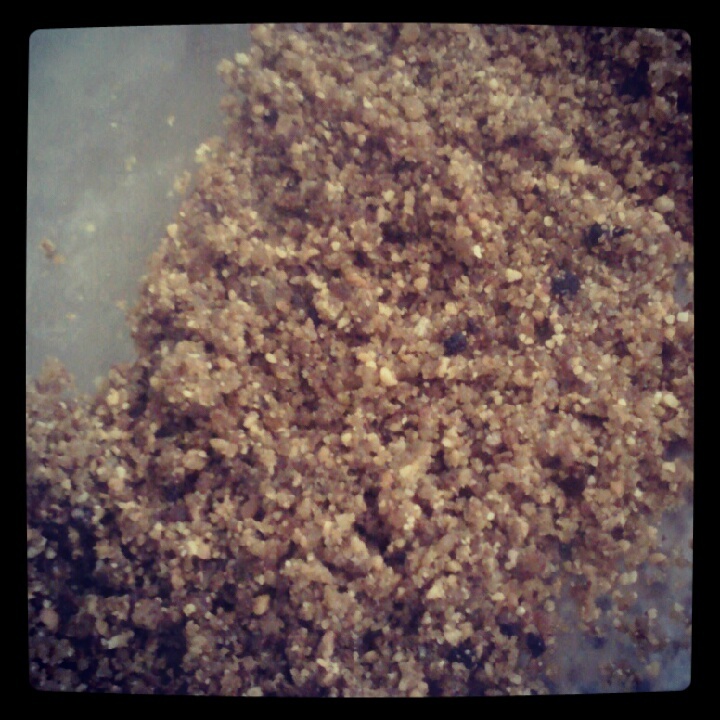 Pour wet mixture into dry and add in chia or flax egg. Pour batter into baking dish sprayed with nonstick cooking spray and bake for 30-40 minutes, or until golden brown on top. Makes 8 slices. Mine didn’t rise a lot (stupid high altitude baking!) but it was still tasty and very dense. It’s a lot healthier than the typical banana bread and isn’t quite as sweet but for around 110 calories per slice, it makes the perfect snack crumbled in almond milk or spread with almond butter. And I love the slight coffee taste it has! Next time I would add even more coffee to it. Oh, and my junk food-loving little sister loved it, so that’s saying a lot! 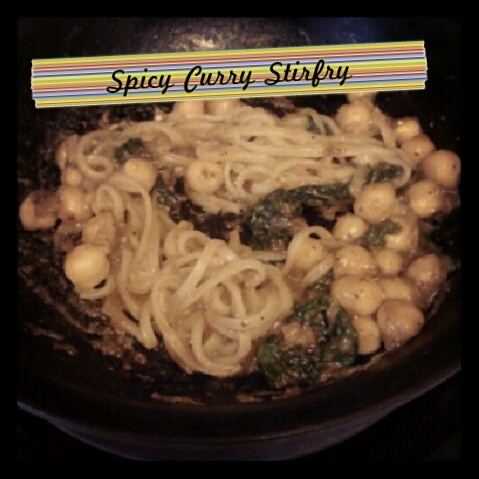 This recipe is being submitted for this week’s (September 7) Healthy Vegan Friday. What’s your favorite kind of bread to eat? Do you like red sauce, white sauce or pesto? Like a lot of bloggers out there, I love me a good salad. Not just any lame rendition of greens and too much dressing will do, though–it’s gotta be flavorful and unique. There are a couple restaurants that actually make some pretty awesome salads (like Panera and Chipotle) and Whole Foods always has some amazing versions at their hot and cold bars but making my own almost always beats them out because I control what goes in…and I can make them huge to last for several days! Lately I’ve been feeling pretty creative when it comes to salads and I made a couple in big batches so I can enjoy them again and again. And luckily, they’re delicious enough that I want to eat them daily! 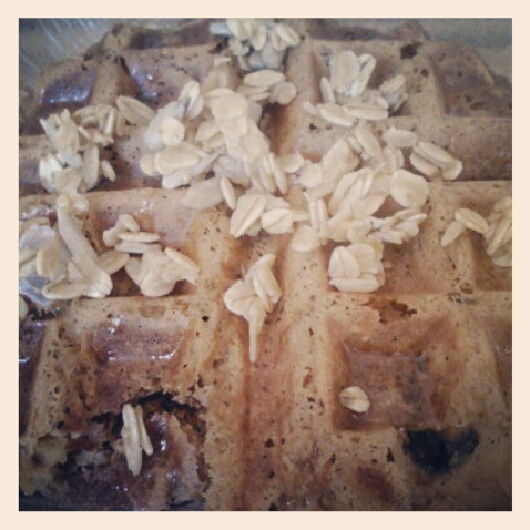 Breakfast: peanut flour chocolate chip waffle topped with sunny “raw”nola and honey vanilla agave. I’ve been on a pancake kick lately but I’ve been wanting to switch it up so I dug out the waffle maker and decided to wing a high protein waffle. I based it off my peanut flour pancake recipe and it actually turned out almost perfect. Sure, it was a little thin and crispy but I loved it, especially with a few dark chocolate chips thrown in there and topped with my sunny “raw”nola and agave. 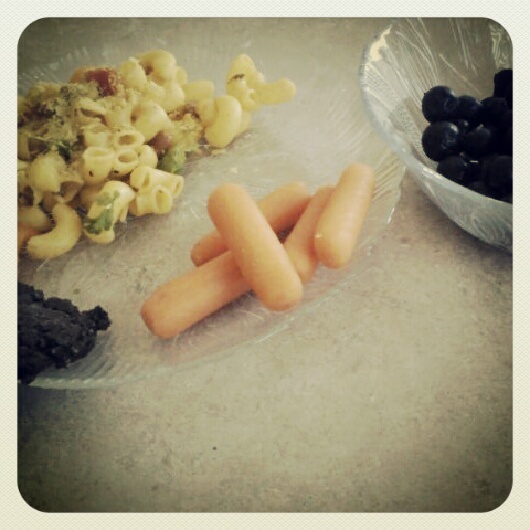 Lunch: southwestern style pasta salad, baby carrots, half a raw brownie, fresh blueberries. This pasta salad was not totally thought out, but it worked. It’s been hotter than hell here lately (in the upper 90s, yikes!) so I’ve been wanting chilled dinners. I boiled some quinoa pasta (I love it more than whole wheat pasta and it’s gluten free), cooled it off and mixed it with pinto beans, chopped sweet peppers, cilantro and a homemade dressing made with a little olive oil and chili lime seasoning. It made a huge batch–I had some for dinner on Sunday, lunch on Monday and I still have a ton left. Of course, I topped it with some nooch, aka my obsession and served it with a delicious raw brownie that I froze, baby carrots and blueberries. Perfect summer lunch. 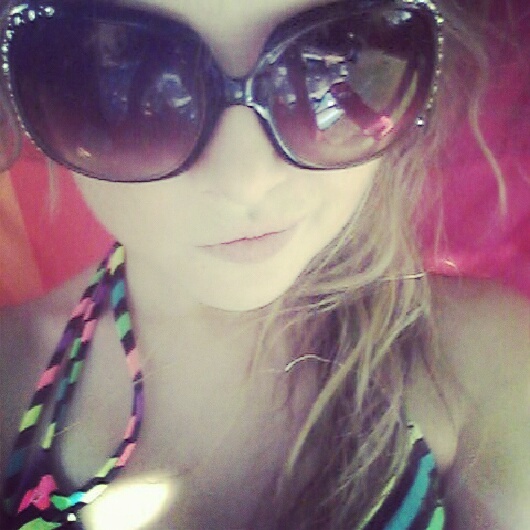 Pool time is where it’s at! 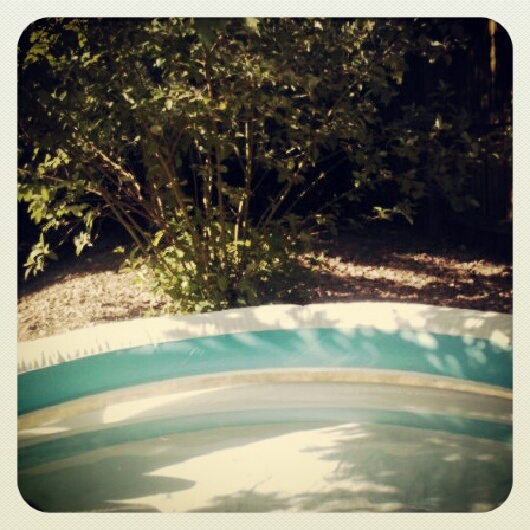 Kiddie pool time, that is! Speaking of being hot, we just invested in an inflatable pool for our new backyard. 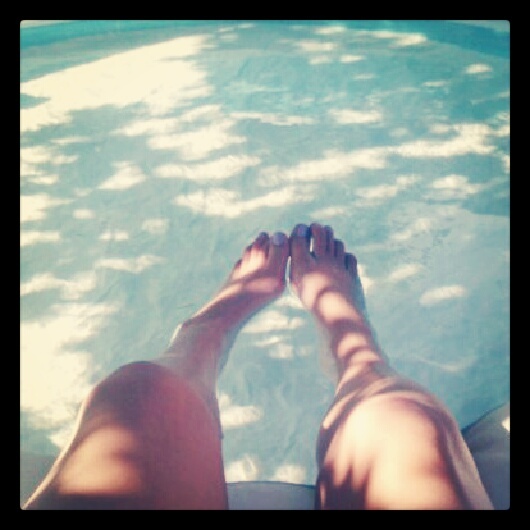 My sis and I tried sitting in it for awhile on Monday but the water was a little too freezing. We ended up just settling for putting our feet in it and it helped cool us down, at least for a little while. 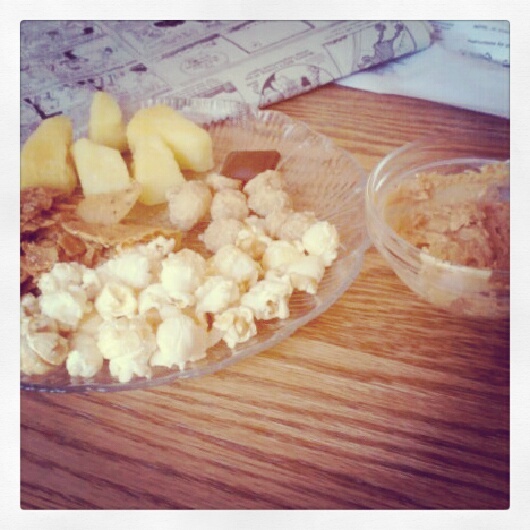 Snackplate: kettle corn, sweet potato multigrain chips, frozen pineapple, Chocolove coffee crunch chocolate square, maple macadamias, peanut flour paste. Nothing crazy or new here, just a different variation on my typical snackplate. Dinner: Moroccan quinoa salad, unpictured carrot cake smoothie. This salad was more thought out and actually turned out pretty delicious. I dubbed it the Moroccan salad because the flavors seemed Moroccan-ish but what do I know?! 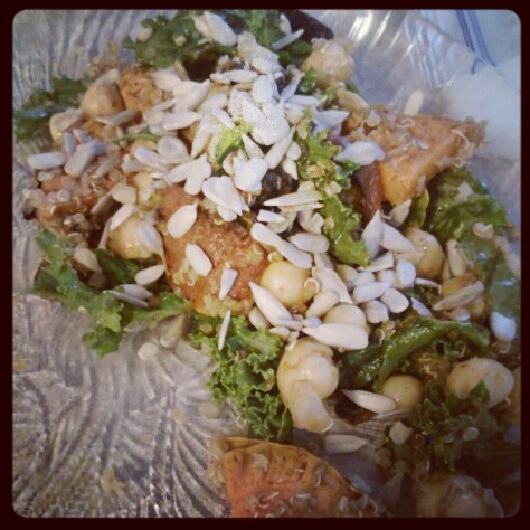 Place chickpeas, raisins and kale in a large bowl or container and set aside. Cook sweet potato in microwave for 3-4 minutes, or until partially cooked but still firm. Slice into thin rounds, brush with a little olive oil and some spices and place on oiled grill (or grill pan) for 15 minutes or until the sweet potato gets grill marks. Make quinoa (boil 1/2 cup of water, add in rinsed quinoa, turn down heat and let simmer, covered, for 15 to 20 minutes) and then stir in with chickpea mixture. Once sweet potato is cooked, chop slices into quarters and add in with chickpeas and quinoa. In a small bowl, stir together olive oil, apple cider vinegar and spices until it forms a thin paste (add water if needed to thin out). Mix it all together and let it sit in the fridge for at least half an hour. Top with sunflower seeds. Makes 4-5 servings. 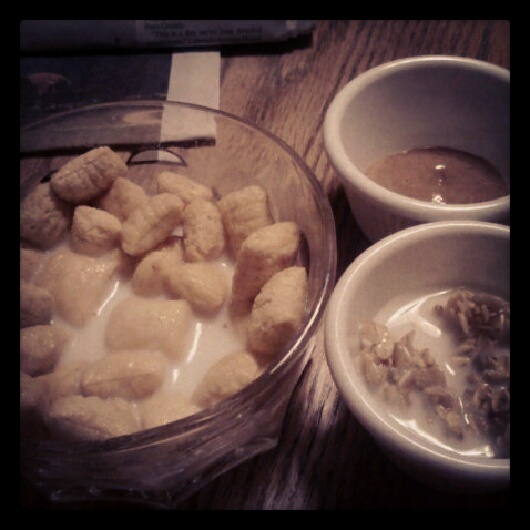 Dessert: peanut butter Puffins in almond milk, sunny “raw”nola, almond peanut cashew butter. Cereal is the best way to end the day, obviously! 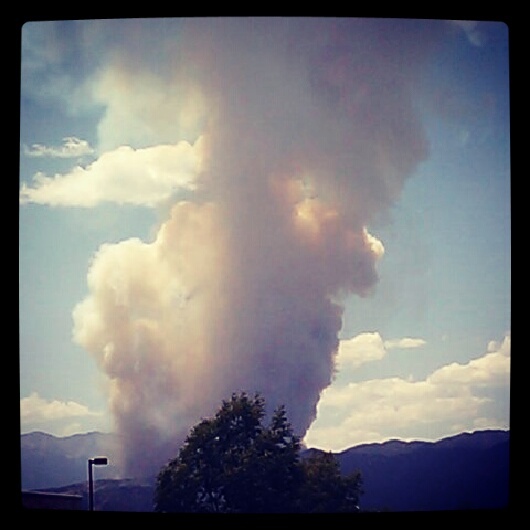 Oh, and before I forget–please keep Colorado in your thoughts and prayers. There have been way too many wildfires here within the past month and a lot of people have been displaced temporarily or even lost their homes. There are large fires burning near both of the cities I call home (my college town and my hometown) and it’s been kinda scary watching the news lately. Thanks for thinking of us! What’s the most random salad you’ve ever made? 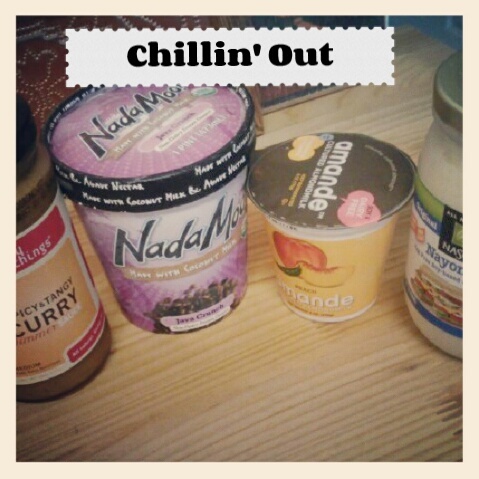 How have you been keeping cool (if it’s hot where you are)? I like eating healthy, but I also like to enjoy what I’m eating. If I’m not liking what I’m putting in my mouth, then what’s the point? Luckily, I’ve trained my taste buds to love nutritious things, like kale salads and raw seeds, but I still like to have fun with my food. That being said, this week’s WIAW features a few of the meals I’ve been enjoying lately, with the ‘secret’ (or not so secret) nutrition aspect of the food too! 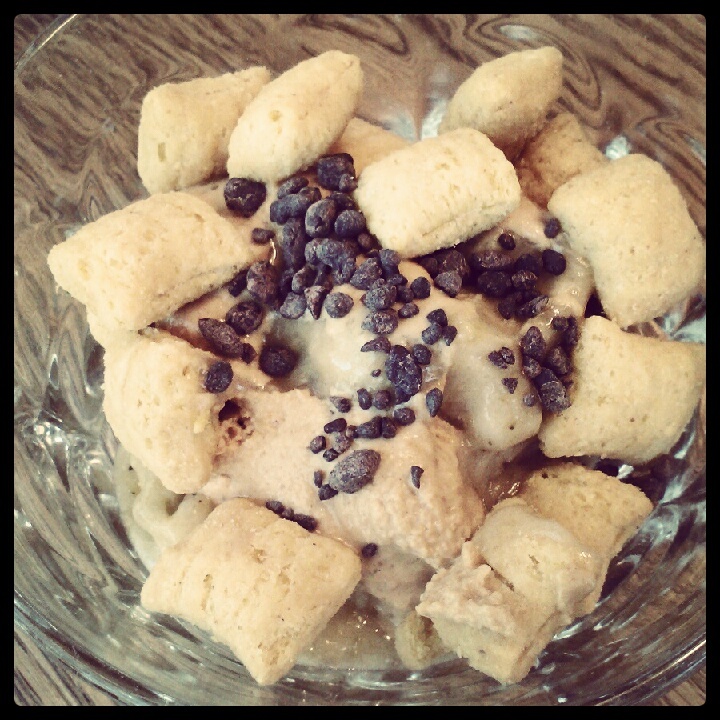 Breakfast: banana softserve ‘sundae’ topped with peanut flour paste, cacao nibs and PB Puffins. Secret: Cacao nibs. These tiny dark brown bits are raw and packed with magnesium, which helps with muscle function and bone strength. They also have more antioxidants than blueberries, green tea and red wine! Cacao nibs pack a powerful healthy fat punch and can boost your energy. 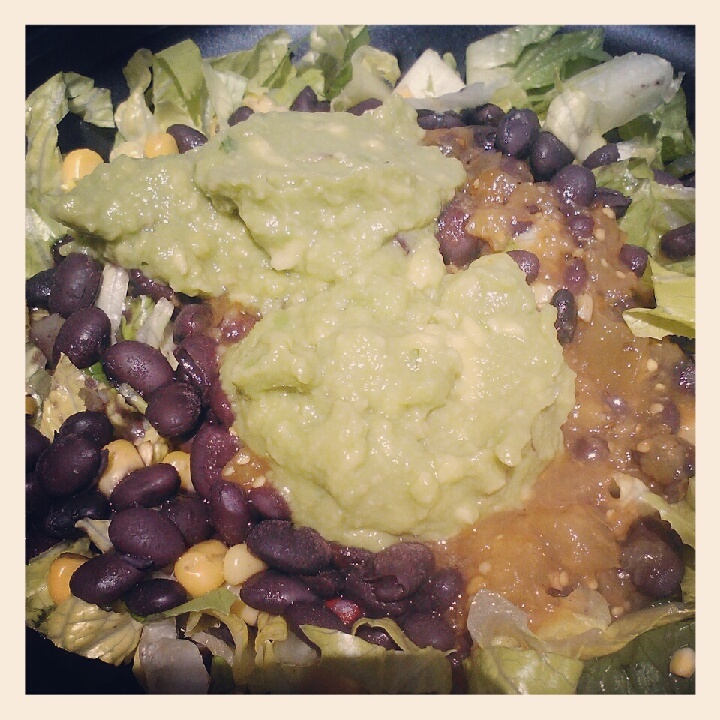 Lunch: Qdoba naked taco salad with romaine, black beans, habanero salsa and guacamole. Secret: habanero peppers and guacamole. Habaneros are one of the spiciest peppers (between 100,000-500,000 Scoville units) because of their high concentration of capsaicin. Capsaicin can help lower cholesterol, blood pressure and can even increase the body’s metabolism while consuming it. Guacamole is made from avocados, which can increase absorption of lycopene and beta carotene when combined with lettuce or spinach. Avocados are a great source of healthy fats, and their oleic acid can increase absorption of fat-soluble nutrients. 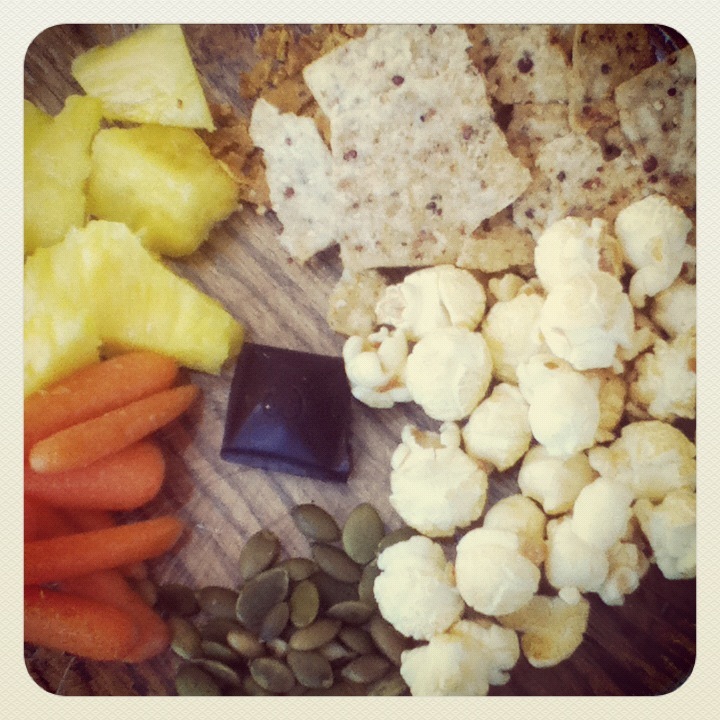 Snackplate: organic kettle corn, Way Better Snacks Simply So Sweet Chili multigrain chips, fresh pineapple, baby carrots, tamari pumpkin seeds, Chocolove peppermint dark chocolate. Secret: pumpkin seeds and multigrain chips. Pumpkin seeds are a great source of magnesium, manganese, zinc, iron and protein. Their phytosterols can help lower cholesterol, and the seeds have anti-inflammatory benefits. This brand of multigrain chips is probably the healthiest I’ve found. All of the ingredients are real foods, and the chips are full of healthy fats in the form of sprouted flax seeds and sprouted chia seeds. The chips are also made with sprouted quinoa, stone ground corn and sprouted broccoli seeds, and are low in sodium. Dinner: spicy mac ‘n cheez (quinoa pasta, Field Roast Mexican chipotle vegan grain meat sausage, spicy nacho cheez sauce, nooch). Secret: nooch, spicy cheez sauce, quinoa pasta. Nooch, aka nutritional yeast, is a vegan staple for a reason. It’s a complete protein source (the brand I used has 8 grams per serving) and is full of necessary vitamins including B12. The spicy cheez sauce recipe can be found here and it’s made with simple, whole ingredients including raw cashews. Cashews provide heart-healthy monounsaturated fat and magnesium which helps with bone health. They also can prevent gallstones. Quinoa pasta is made from two simple ingredients, quinoa and corn, so it’s perfect for a gluten-free diet. It’s full of fiber and protein, so it can fill you up faster than traditional white pasta, plus it has all the benefits of quinoa. 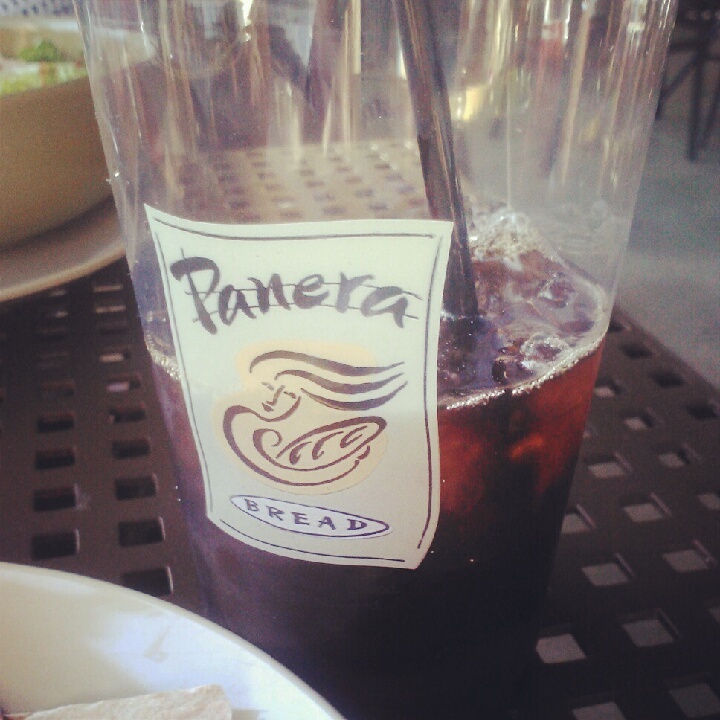 Unsweetened brewed iced coffee from Panera. Secret: coffee. This tropical bean is full of antioxidants, helps prevent the onset of type 2 diabetes and protects against some forms of cancer. Without any milk/cream or sugar added, it’s a very low calorie drink. To boost your iced coffee, add in unsweetened almond milk and stevia for minimal calories. What’s something you enjoy eating that also has a ‘secret’ benefit? Do you like iced coffee? Happy WIAW…and happy birthday to my lovely madre! She is one lucky lady, having both her birthday and Mother’s Day in the same week. I’m so glad school ended just in time for me to be home to enjoy both days with her. I haven’t gotten around to taking photos of an entire day’s worth of eats (bad blogger, I know, but it’s just slipped my mind most of the time) so this week’s WIAW is just a random compilation of the best of what I’ve been eating this past week along with a recipe and some new grocery store finds. 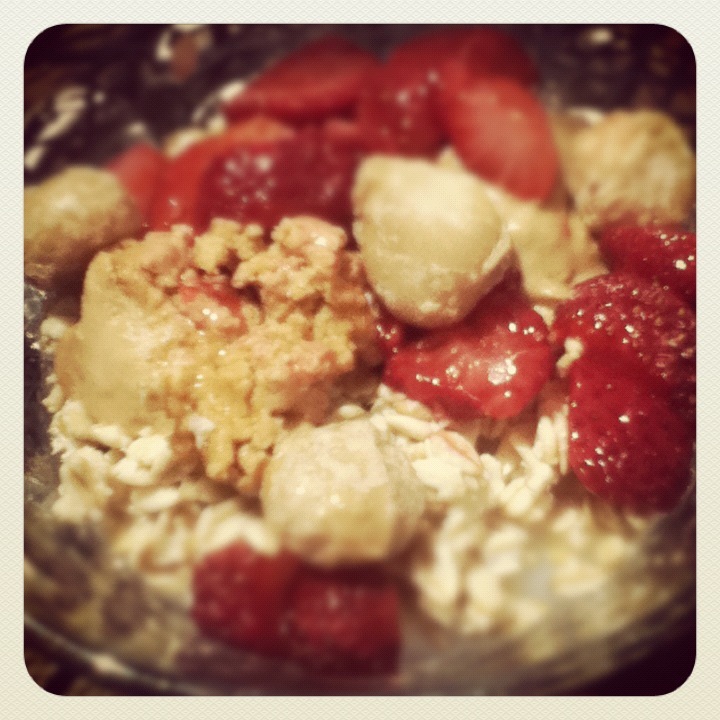 Breakfast: overnight oats topped with peanut flour paste, sunflower seed butter, mashed strawberries and maple macadamias. This is my new favorite overnight oats combo. Peanut flour paste, sunflower seed butter, fresh strawberries and maple macadamia nuts are surprisingly yummy together, and taste like summer. The maple macadamia nuts are a new obsession of mine from the Whole Foods bulk section. They are expensive (18 bucks per pounds, yikes) but they’re so worth it. 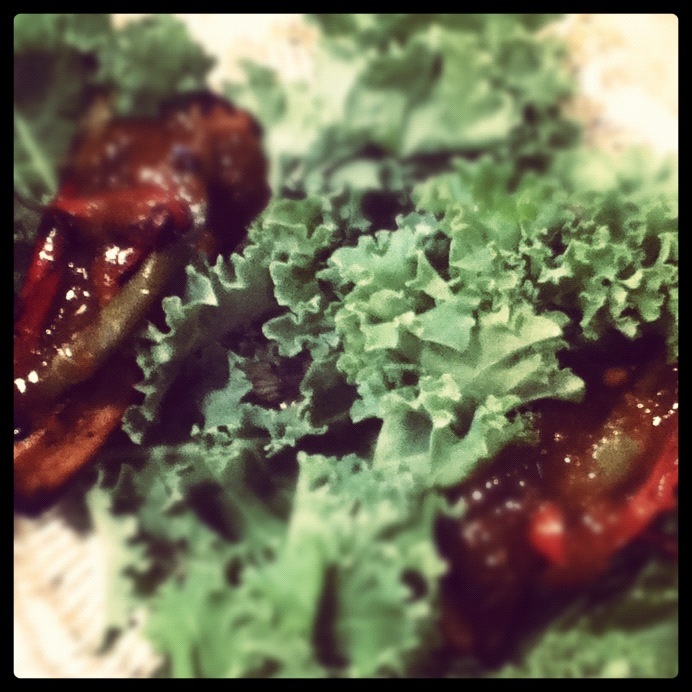 Lunch: kale wraps with cold grilled tofu strips, sauteed bell peppers and Ginger People hot ginger jalapeno sauce. Move over, lettuce wraps! Kale wraps are heartier, more nutritious and delicious. One day for lunch I decided I didn’t want a salad but I still wanted to get my greens in. So I took a few heads of kale, partially destemmed them and filled them with leftover fajitas filling, aka grilled tofu strips and sauteed peppers. I drizzled them with my new favorite sauce, and they turned out perfectly spicy and crunchy. Lunch: chopped kale, sundried tomatoes, artichoke hearts, sprinkle of nooch and vegan Caesar dressing thinned with almond milk. 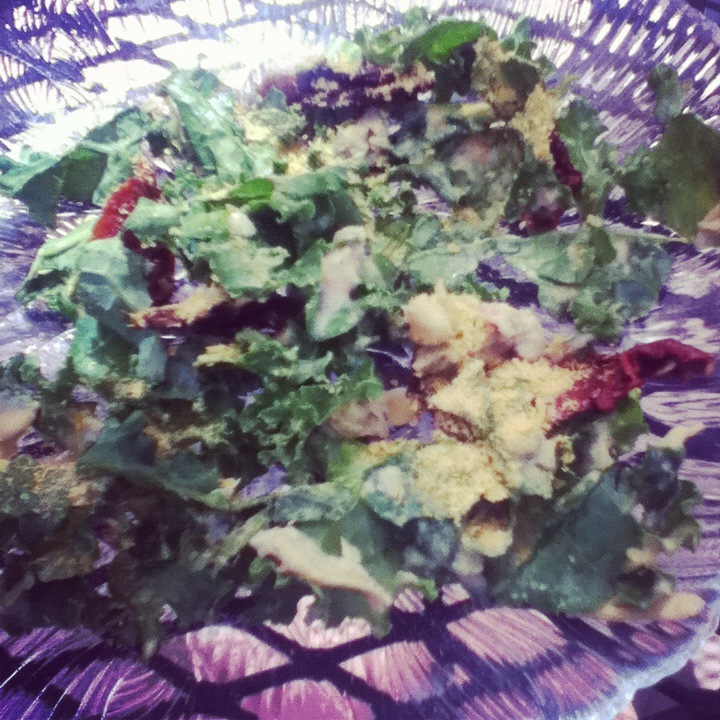 I’ve also been loving raw kale salads for lunch lately. The key is to let the greens soak up the dressing or sauce overnight and marinade with the other ingredients. Oh, and nooch is a necessity for me. This was a Mediterranean inspired salad that I’m definitely repeating. It would be great for dinner bulked up with some chickpeas and kalamata olives. 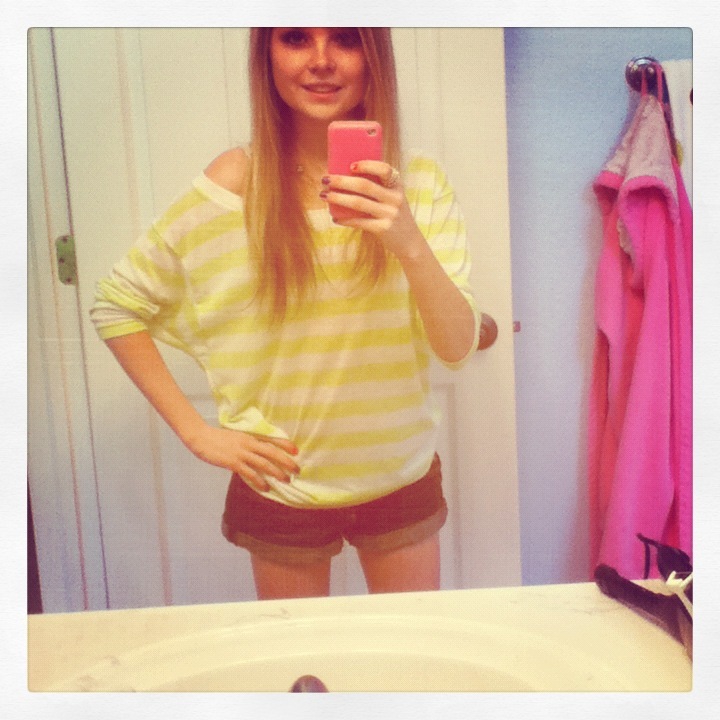 Lime green striped oversize tee (American Eagle), denim cuffed shorts (Abercrombie Kids). Can you believe I wore this outfit on a day it snowed? Okay, so I definitely changed into something more weather-appropriate when I had to go out that night to see a performance of Hairspray (really good, BTW) but it’s crazy to think that it didn’t snow at all here in March or April, and then we get dumped on practically in May. What?! 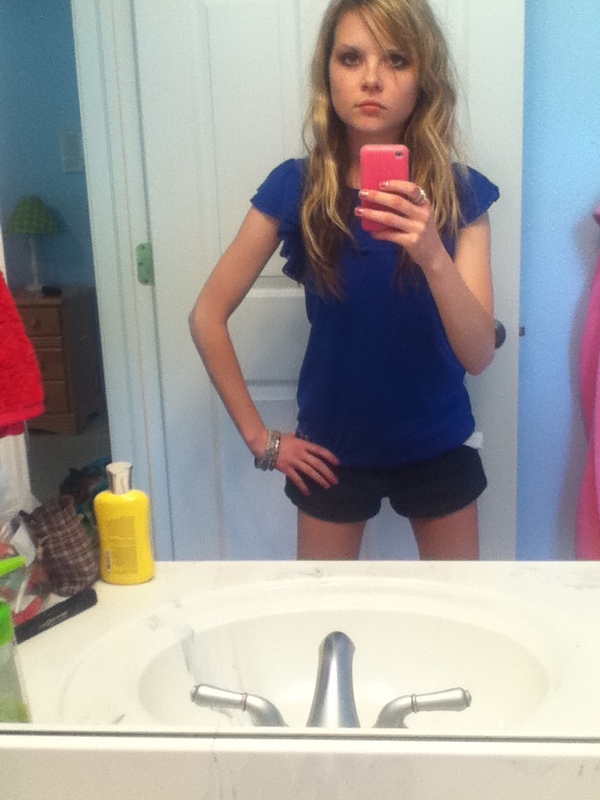 White cardigan (Target), navy lace tank (Abercrombie Kids), navy plaid shorts (Hollister). I’m not complaining though because after a weekend of rain, light snow and thunder (yeah, Colorado’s weird!) it was back to shorts weather by Monday. I enjoyed a little time outside and did a stairs workout that left me tired (in a good way) and hungry. Running up and down the stairs of my deck was no joke, but it was a fun, heart-pumping workout that I like to do every once in a while to change things up. My new-to-me Whole Foods finds. I’m pretty sure I can’t go to Whole Foods without trying out at least one new thing. When I went over the weekend, I hit the mother lode and got mostly all new-to-me things. So far, I’ve tried the quinoa pasta (better than whole wheat or regular), ginger peanut sauce (perfect for Asian dishes), maple macadamias (0b-sessed! 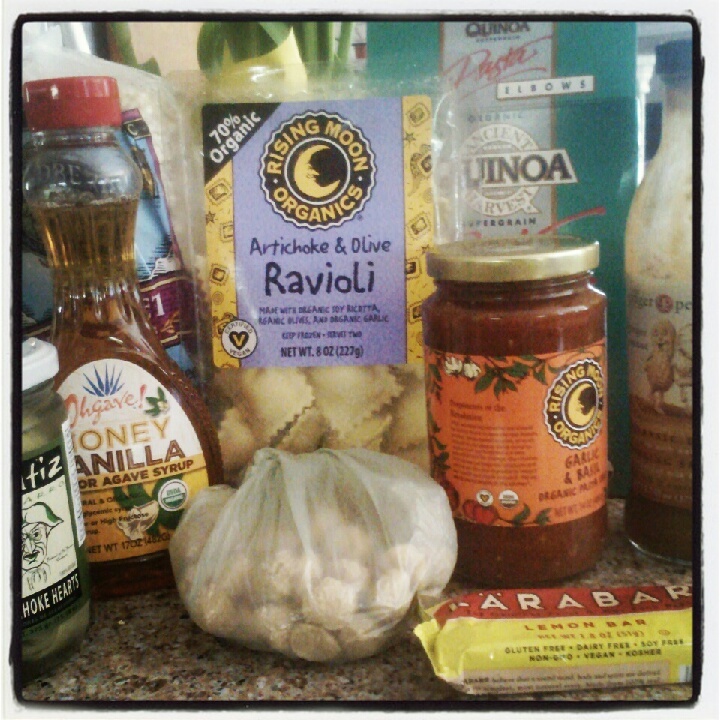 ), rice cakes (pretty plain but good with toppings), honey vanilla agave (great sub for pancake syrup) and artichoke hearts (basically like any other artichokes, which I love) so I’m excited to try the lemon Larabar, vegan ravioli and pasta sauce. 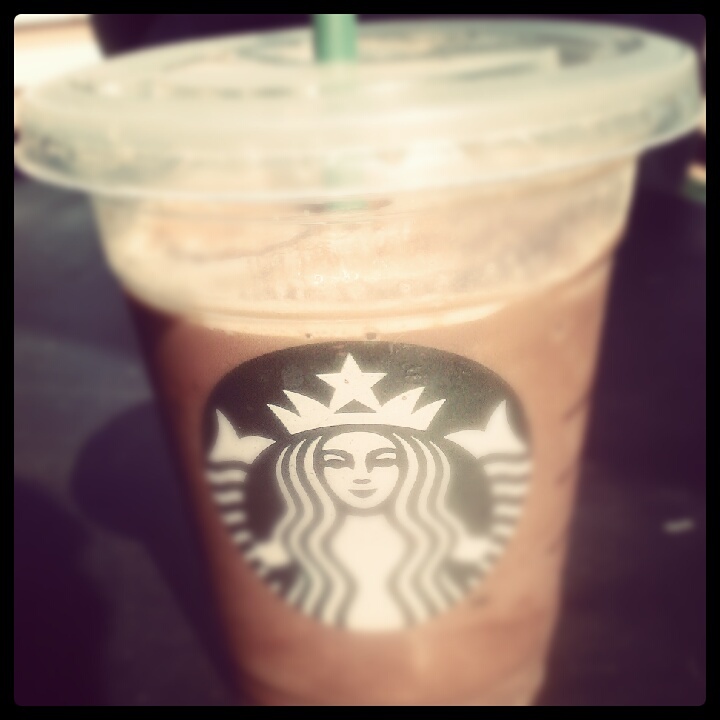 First Frapp of the summer: tall mocha light with soy and 1 pump raspberry. So effing delicious! You know me, can’t pass up Starbucks, especially when it’s half price. Sadly, I only got to take advantage of their happy hour once, but I’m glad I did for the deliciousness above. Mocha light Frappuccinos are my absolute favorite, and they get even better with the addition of a pump of raspberry syrup. If you love the chocolate and raspberry combo, order this. Now. I’m growing my own cilantro! 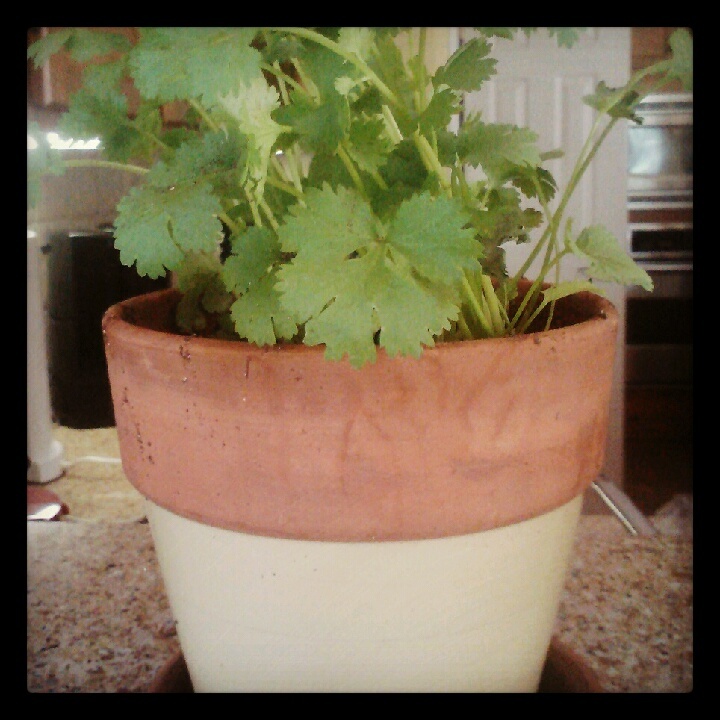 Get ready for a whole lotta pico de gallo recipes around here…because I officially have my own cilantro plant! My dad’s growing a mint plant so we are definitely stocked up on two of the best herbs. Last summer I grew strawberries and while there weren’t many and they were tiny, it was cool to grow my own stuff. The cilantro already looks pretty healthy and vibrant, so I’m excited. California Pizza Kitchen’s half Thai Crunch salad without chicken, dressing or wontons…so basically Napa cabbage, carrots, avocado, edamame, peanuts and Ginger People ginger peanut sauce. I love me some giant salads. I had one on Thursday post-final at Mad Greens with my dad (no picture, but it was spinach/artichoke hearts/kalamata olives/garbanzo beans/sunflower seeds with fat free balsamic) and I had one on Sunday night to celebrate Mother’s Day. We got CPK to-go and I was debating between a veggie pizza without cheese and this salad. 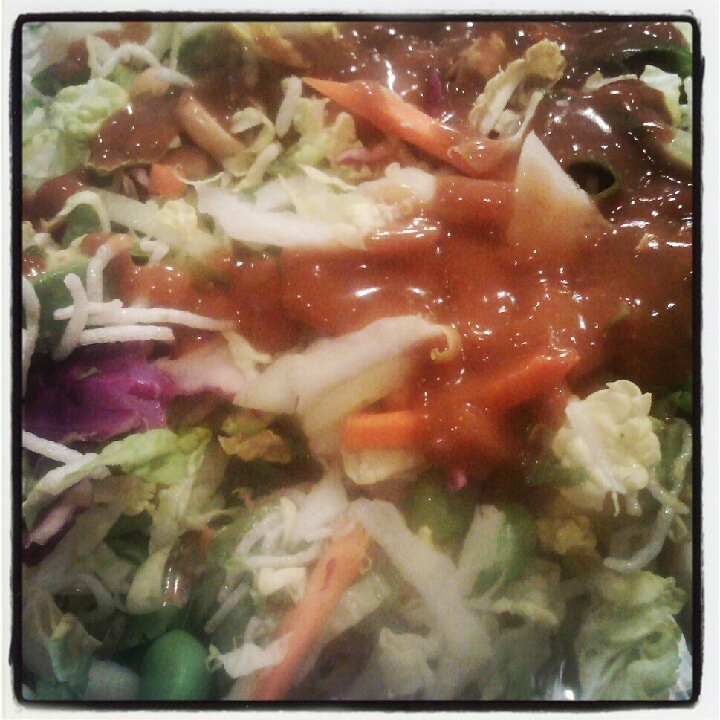 Glad I went with the salad, even though there aren’t any leftovers (boo!) We hadn’t eaten at CPK in well over a year and I almost forgot how much I love them and their giant salads. Plus now I know that they’re totally accommodating to vegetarians, vegans, gluten-free people and also if you’re picky like me and don’t like wontons or restaurant dressings. I totally demolished this salad and for the record, it took up my entire regular-sized dinner plate. No shame! Definitely freeze these if you want to be able to eat them whole! I made raw blondies for the first time last summer and they were definitely a hit…well at least with me, since my family’s wary of trying raw desserts. I made a new and improved version the other day and while they’re crumbly and messy, they’re simple and healthy, with just 4 ingredients. Blend almonds and dates in food processor or high powered blender until mostly combined and crumbly. Add in agave and protein powder until mixed in. Pack blondie mixture into a square glass dish and keep frozen (so the blondies don’t crumble). Makes 4 blondies. 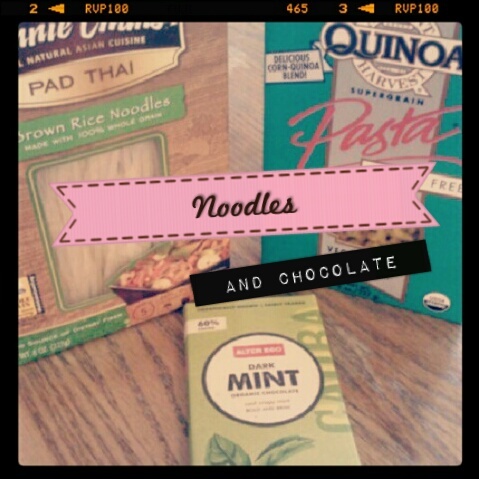 Have you ever tried quinoa pasta? What’s your favorite “special” nut? Hi girlies! Hope you enjoyed your weekend! As I mentioned in my last post (which I loved all the comments on, BTW!) I went home this weekend, actually for the first time since spring break. And I’m headed back home this weekend, because of Easter. I know it seems like I go home for the weekend a lot but I only live about a 2 hour drive away, so it’s not a huge haul plus having no car means my weekends on campus are super-boring (yet really good for getting homework, papers and studying done). Usually I go home every other weekend, and it’s nice to get a little break from college life, and I love my family to death so it’s a win-win. Anyways, I wanted to recap my weekend for this week’s edition of WIAW. Instead of just sharing all my eats (most of which went undocumented, unfortunately), I also wanted to give you all a little insight into what I was thinking regarding food/fitness this weekend. As I’m sure you can guess, I still struggle a lot with disordered thoughts but I think letting them out is a good way to figure out where they’re coming from and how to refocus them. Oh, and P.S. today (Tuesday) is my daddy’s birthday! I won’t get to be there to celebrate with him but I’ll just have to have a belated party for him this weekend! After writing my hand off finishing an essay exam in my only Friday class, I waited around until my mom and sister got here to pick me up. Usually it’s just my mom, since she doesn’t work on Fridays, but it was their spring break this past week, so my sister was able to come up and get me too. We are really close, so I loved seeing her again. We had plans to go out to lunch, which I was really excited for. My mom let me pick the place, and being indecisive as usual, I had come up with 3 or 4 possible places. We checked out two of them and finally decided on Ingredient, which is a small chain restaurants with locations in Colorado (where we went, obviously), Missouri, Kansas and Nebraska. I had looked up the menu ahead of time and I found plenty of things that were Ashley-friendly, aka vegan (or could be modified to be vegan) and ‘safe’, ED-wise. Yes, looking up menus/nutritional facts ahead of time is a habit I’ve clung to, I pretty much do it every time I’m planning on going out to eat, not just to find the lowest calorie item, but also now because I’m eating primarily vegan, and non-vegan things can be hiding in almost anything! I would like to move away from the calorie researching thing, but it’s still a scary thing for me not to know the calories in something. Anyways, we settled on Ingredient and we enjoyed the sunshine and warm weather outside as we waited for our food. Like I said, the restaurant had a lot of options for me, but I ended up getting something ‘safe’, aka a build-your-own salad. But to be honest, I didn’t order it just because it was safe, but because I really love getting to make creative salads. I ordered napa/bok choy mix topped with fresh jalapenos, artichoke hearts, fresh strawberries, white beans and fat-free raspberry vinaigrette. Random, I know, but it was what was appealing to me at the moment. And I did love the salad, but I mostly just ate the toppings because the lettuce ended up being hearts of romaine, and it wasn’t very tasty. But…I kinda regretted getting it, because I saw that they had other yummy-sounding options, like a falafel sandwich, a veggie burger with whatever toppings you wanted and make-your-own pizza (which I could have gotten without cheese). But I chose the ‘safe’ option, and while it was good, it wasn’t very satisfying. 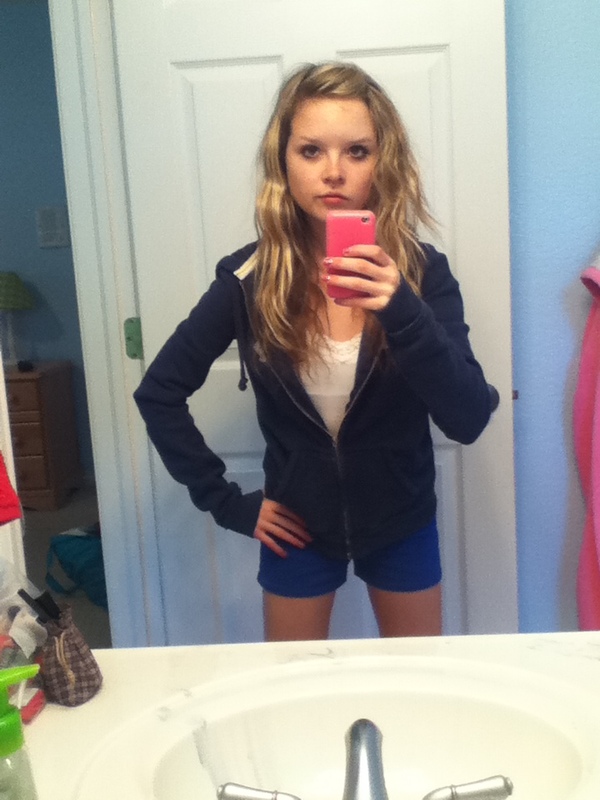 My tennis 'outfit': navy hoodie (Hollister), white cami (Aeropostale), new royal blue yoga shorts (Hollister). The weather was gorgeous, even at 10 in the morning. It was the perfect temperature (around 70 degrees) and the sun was out with almost no wind. We played for almost an hour, but I wasn’t even close to being tired. In fact, I felt like we had only been playing for half an hour! The only issue was, I tripped on my way back from class on Friday (klutz status!) and totally tore up both knees, plus a few layers of skin ripped off one of my big toes. TMI, I know! I was wearing band-aids all over, and of course, my right knee was kinda stiff because the skin was trying to grow back and all that jazz that happens after you fall down. It didn’t really impact my playing, just that I wasn’t able to run to get the ball as much as usual. This made my ED voice act up big time. He was basically just telling me that even though we’d been playing for an hour, it was barely a workout, because I didn’t run as much as I usually would and mostly just walked to get the ball when it went out of the court. Okay, the reason I play tennis is not only to burn calories, but also because I truly love it, but it still made me feel ‘bad’ and ‘fat’ that I hadn’t been able to exert myself as much as usual. 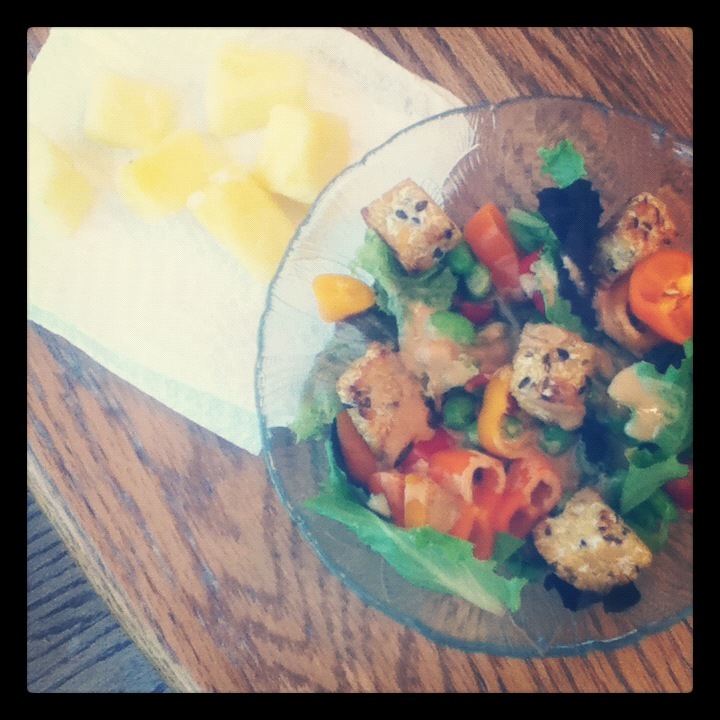 Saturday's lunch: frozen pineapple, mixed greens topped with mini sweet peppers (SO GOOD! ), edamame and flax tempeh cubes. Lunch was…lame. Like I do on most weekends at home, I take advantage of the abundant (or sometimes not-so-abundant) selection of produce and made myself a salad. I was going for an Asian-ish twist, so I whipped up some peanut dressing made with peanut flour and sriracha sauce, and topped the greens with a little edamame, a few mini sweet peppers (a new obsession) and cubed tempeh heated up on the stove. I also had some frozen pineapple on the side. Unfortunately, the dressing turned out to be bland and the edamame was freezer-burned so the entire salad was not too tasty. I ate all the pineapple, peppers and most of the tempeh but had to throw the rest out. Better luck next time? And yes, I know this was nowhere near enough food, especially since I had just played tennis, but I was just not feelin’ it. Of course, later on I was starving–duh, I had barely eaten before! I’m still trying to work out my weird hunger cues–I am rarely hungry after working out, but I definitely feel it later on. After church with my family (a guy from Jews for Jesus came and told us all about the Seder meal for Passover–it was really cool!) we headed home for some dinner. I was very hungry even after having a decent snack a few hours earlier. My mom was going to grill sausages (chicken for my family, veggie for me) and have some salad and fries (aka sweet potato tots for me) on the side. I was excited…until I saw the sausages she bought for me. They were the Field Roast brand, the Mexican chipotle flavor. Um yeah, these sounded totally delicious…but 250 calories for one sausage? That’s about how many calories I’ve been eating for dinner, never mind we were also having stuff on the side! I freaked out, despite the fact that A) they sounded really good, B) they are pretty healthy and non-processed and C) they have 23 grams of protein per sausage (not too shabby!) But the disordered side of me went straight towards the ‘high’ calorie count (which is honestly not that high). I tried to compensate by skipping a bun (I’m not really a fan of them anyway) and only having a half serving of sweet potato tots. This didn’t stop me from mentally beating myself up after dinner, especially when my dad said, “Wow, you must have liked it!” because I ate the whole sausage. Well, yes, I did like it, but I interpreted his comment to mean “Wow, you’re a pig!” Unfortunately, I let his comment get to me and after dinner, I tried to feel better about how much I had eaten (not that much in reality, but more than I’m used to) by doing some cardio circuits for 15 or 20 minutes. I do this sometimes, try to make up for eating what I see as too many calories (aka the number doesn’t fit into my set plan for the day, despite the fact that it might still be not enough) by working out extra. And on top of this, it wasn’t enjoyable because my knee was still hurting and my ankles were sore. That’s been freaking me out–my ankles have ached whenever I’ve been doing cardio since this weekend and I’m not sure why–and I’m scared I’ll have to take a break from daily workouts, which is a big no-no for me. Saturday's real outfit: new flutter-sleeved royal blue tee (Hollister), navy twill shorts with white belt (Hollister). 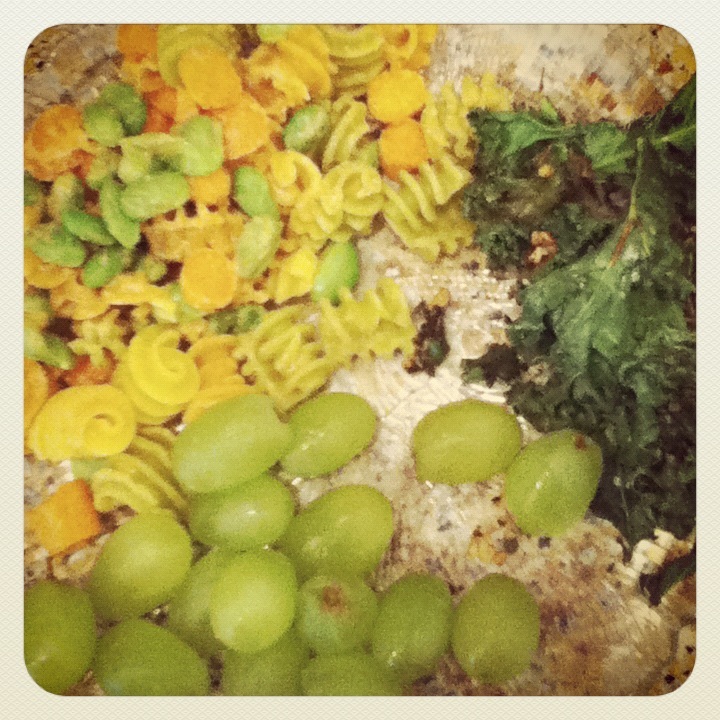 Sunday's lunch: spicy peanut pasta salad, green grapes, garlicky kale. Speaking of lunch, it was a winner, especially compared to Saturday’s. I whipped up a quick pasta salad using quinoa pasta (love this stuff), chopped baby carrots, edamame and spicy peanut dressing (basically the same as on Saturday, but I got the proportions right this time so it actually tasted like something). I also had some green grapes on the side, as well as garlicky kale, which I sauteed on the stove with some salt and garlic until it was crispy. It was so good, I am definitely making this as much as I can! The best part of lunch, though, was enjoying it out on the deck with my family reading the Sunday paper. I love getting to eat outside and enjoy a leisurely lunch, which I never get to do at school. Only 4 and a half more weeks til I can eat outside every day! Before my mom and I had to hit the road, my sister and I went for a quick walk on our street. The weather was perfect and it’s hard to believe it was almost 80 degrees when I was home–it’s been cold, cloudy and windy the past two days, plus it snowed…Colorado is bipolar! 😦 It’s supposed to warm up by tomorrow though. Back in good old FoCo, my mom and I had dinner at Garbanzo, since they were having a buy one get one deal. It was really crowded and busy because of this, but still enjoyable. It’s one of my favorite fast casual places to eat at, since it’s all Mediterranean cuisine, which is one of my faves, and they also have a lot of veg options. 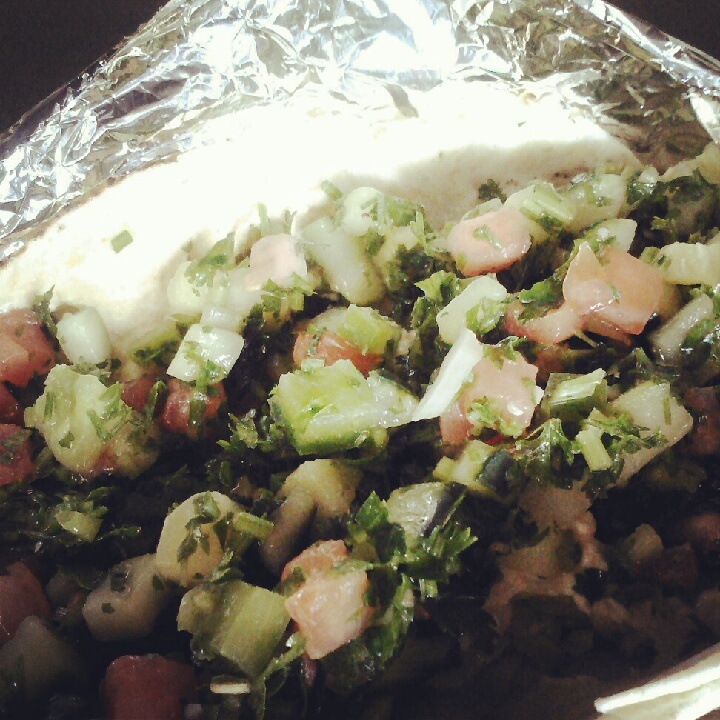 I got my usual plate of hummus, cilantro sauce, fresh red cabbage, tabbouleh (they have the best! ), lettuce and I tried the portobello mushroom this time. I would probably skip it next time, since it was really watery, but it wasn’t too bad. I ate it all minus most of the mushrooms and loved it. And surprisingly, I didn’t feel too guilty about it, which I usually do after eating out. However, Garbanzo is a really healthy place and I truly just love it. 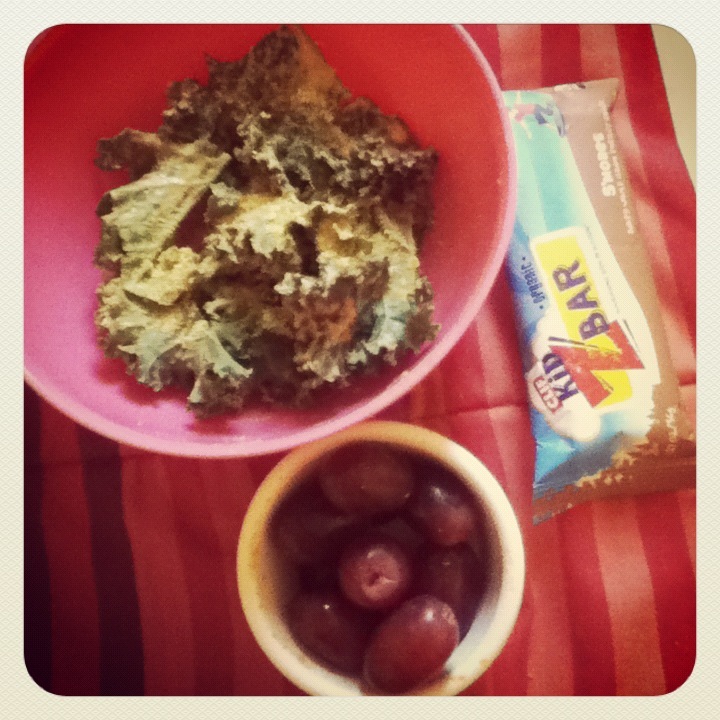 Monday's quick lunch: fresh kale massaged with peanut flour sauce, Clif Kids s'mores bar, red grapes. So yes, I realize this was a monstrous post, but it really feels good to get all my thoughts out there and just be honest with myself and all of you. I really love how Tessa does this with her WIAW posts, because I can always relate, and I think it just adds something rather than just sharing what I ate. I think it’s more important to share the thoughts and feelings behind the food, rather than the food itself. What did you do this weekend? What’s your favorite way to eat kale?